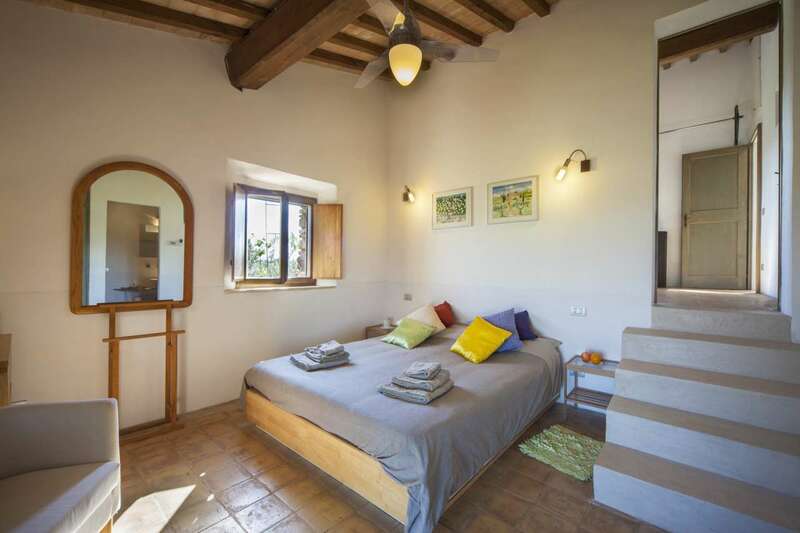 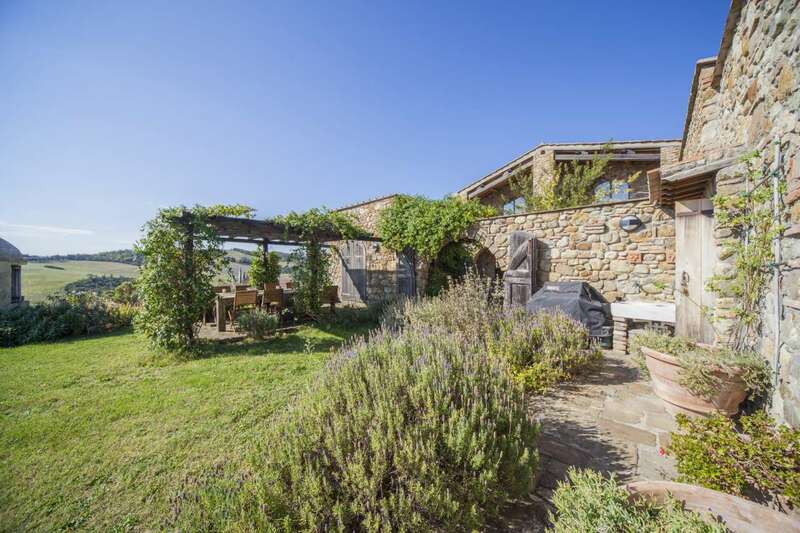 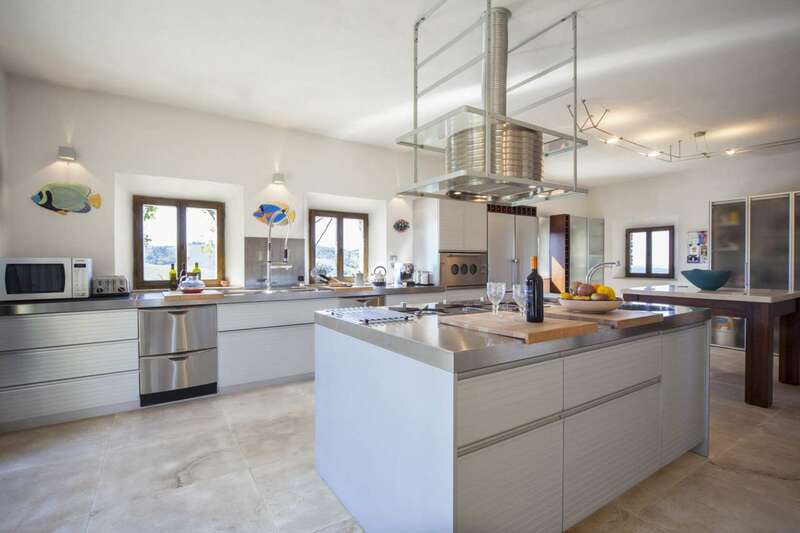 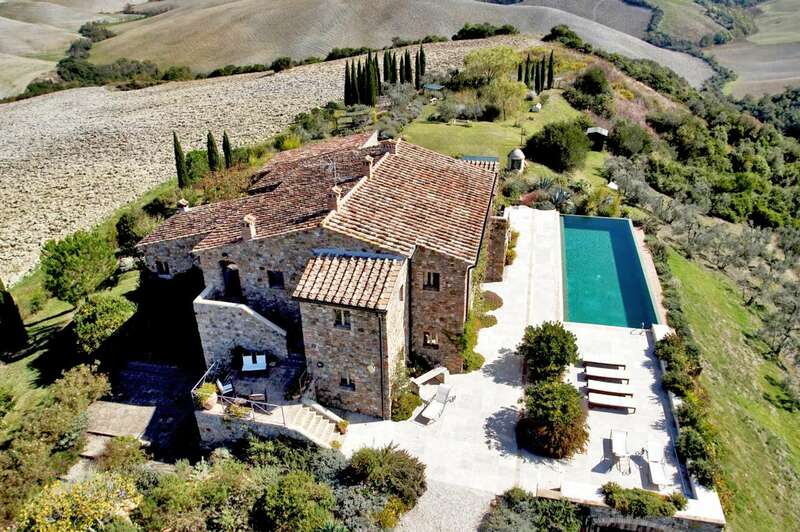 Immaculate Tuscan Farmhouse with Guest House for Sale in Volterra Area. 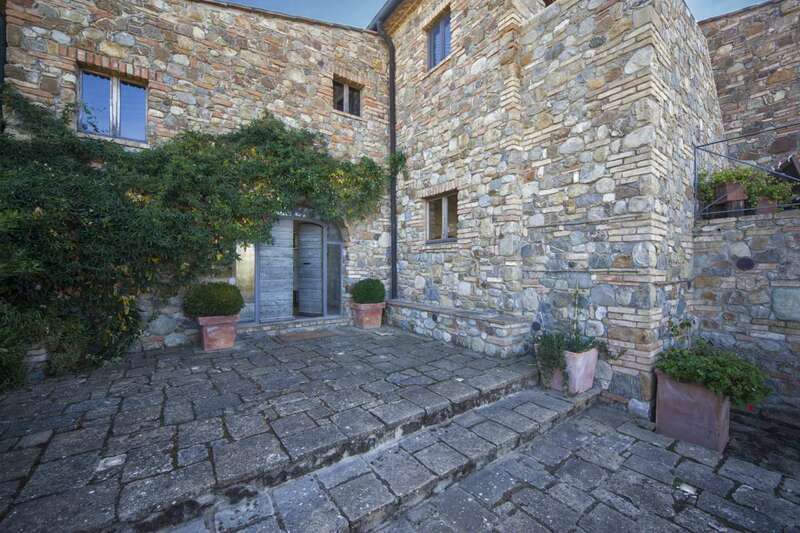 This delightful farmhouse has been meticulously restored and is therefore presented for sale in immaculate condition. 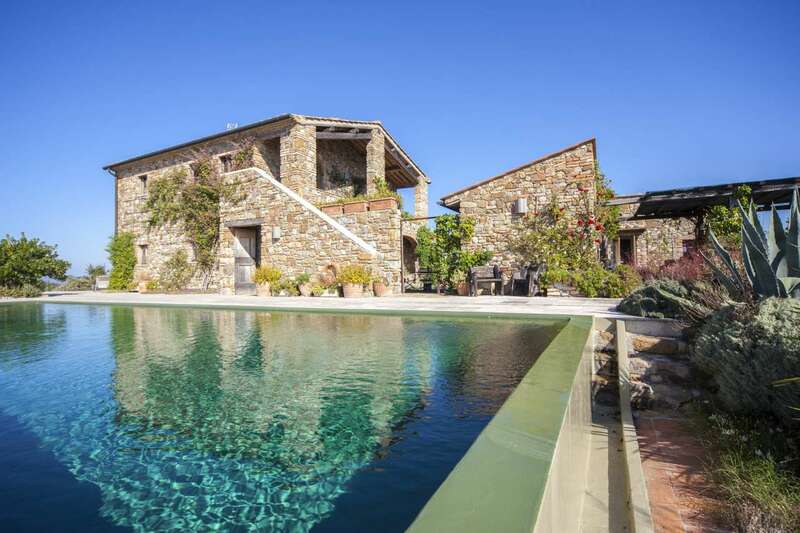 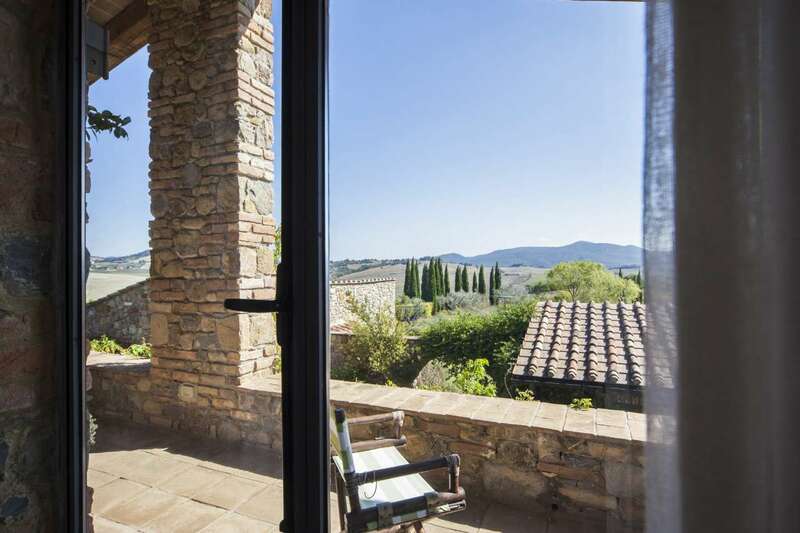 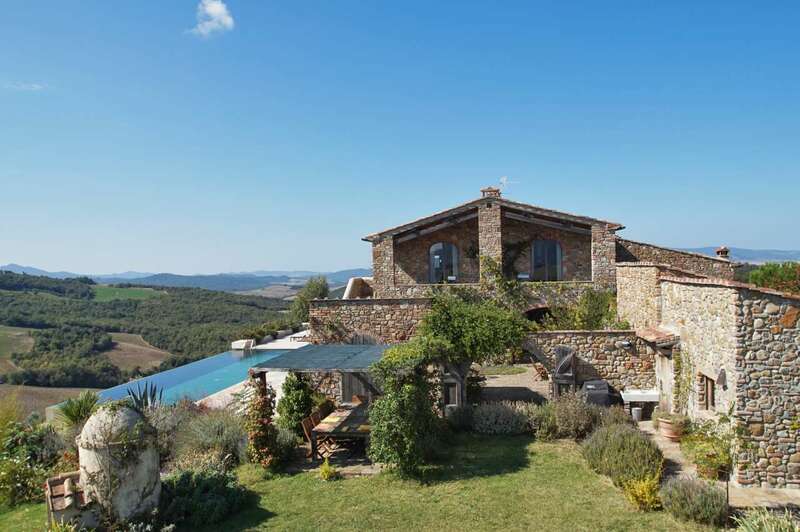 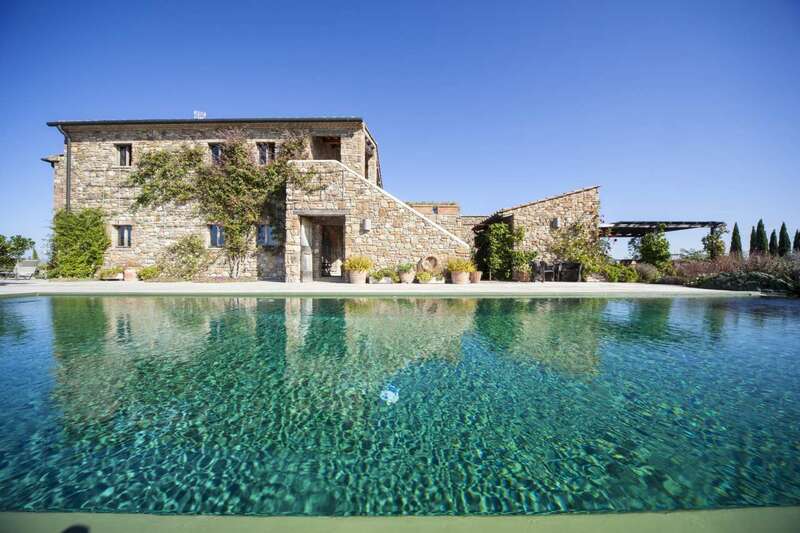 It stands on land of one hectare in a fabulous Tuscan location, amongst the gently rolling hills with views of the nearby medieval hilltop towns. 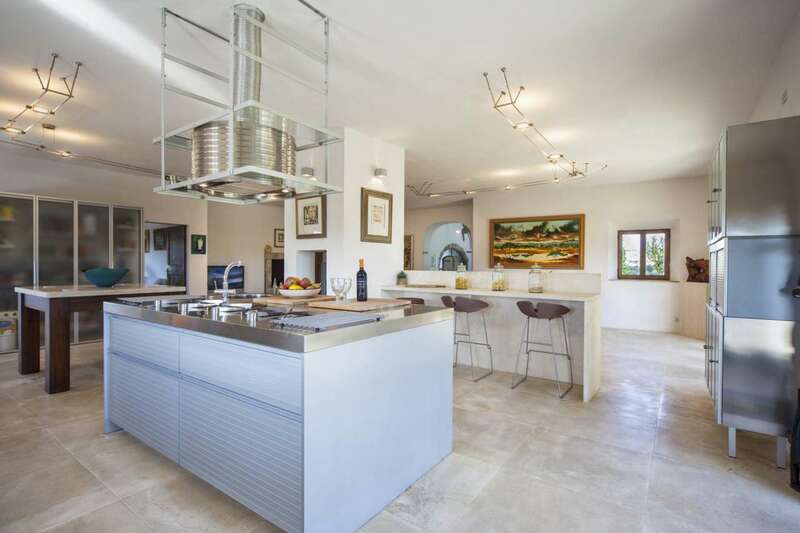 The property comes with 470m2 of internal living space which includes 4 bedrooms, 5 bathrooms and 2 reception rooms as there is also a guest cottage. 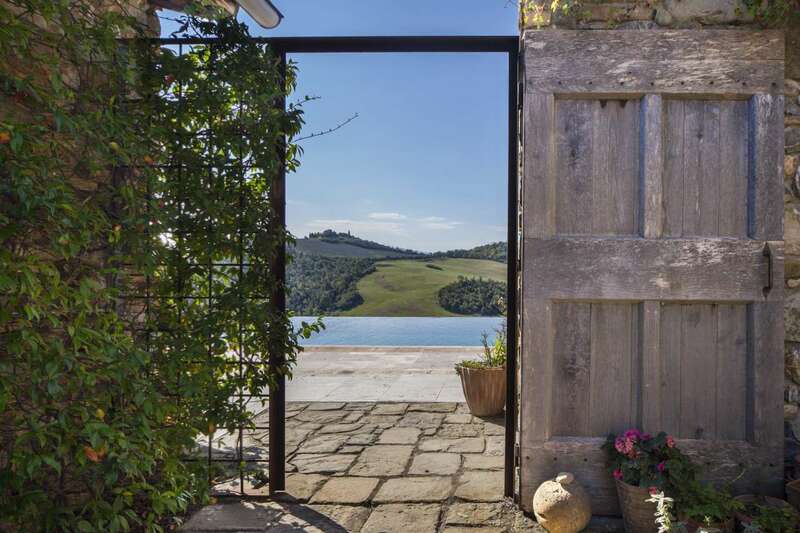 Fifteen minutes from Volterra, this property has been brought back from to life by its current owners who bought it when it was derelict. 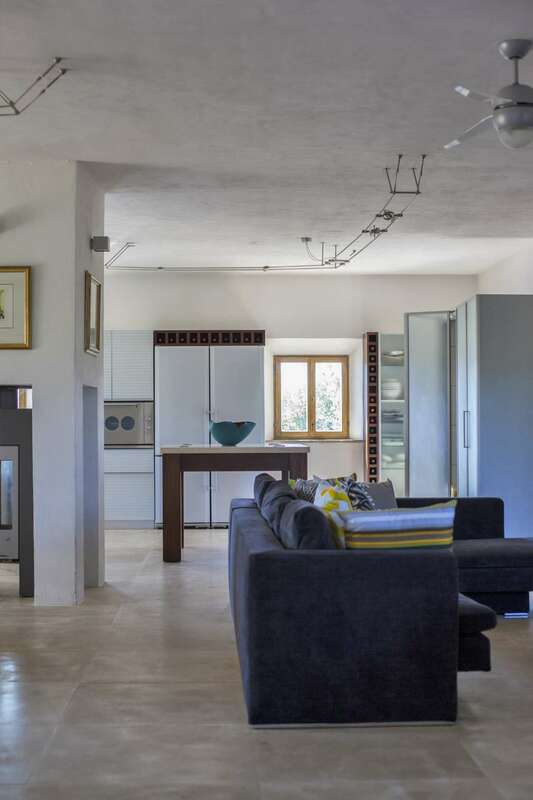 Whilst endeavouring to maintain the authenticity of the ancient farmhouse, elements such as space, natural light and practical yet comfortable living were the main objectives during restoration. 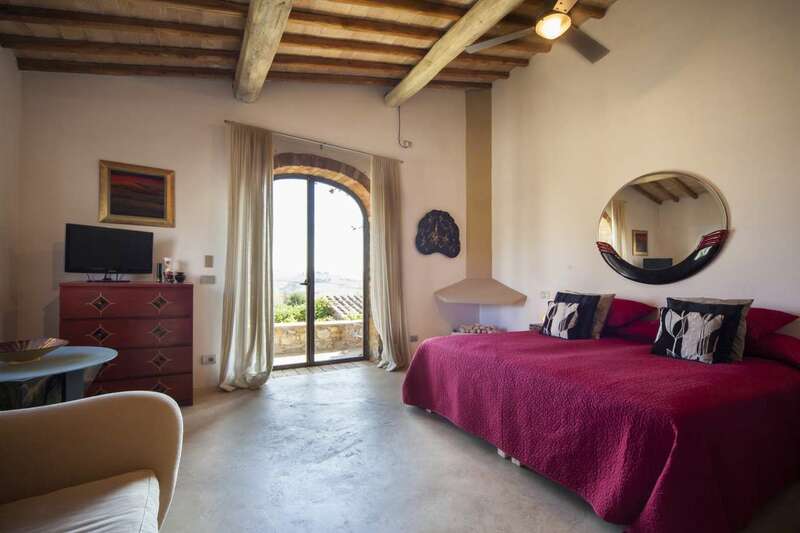 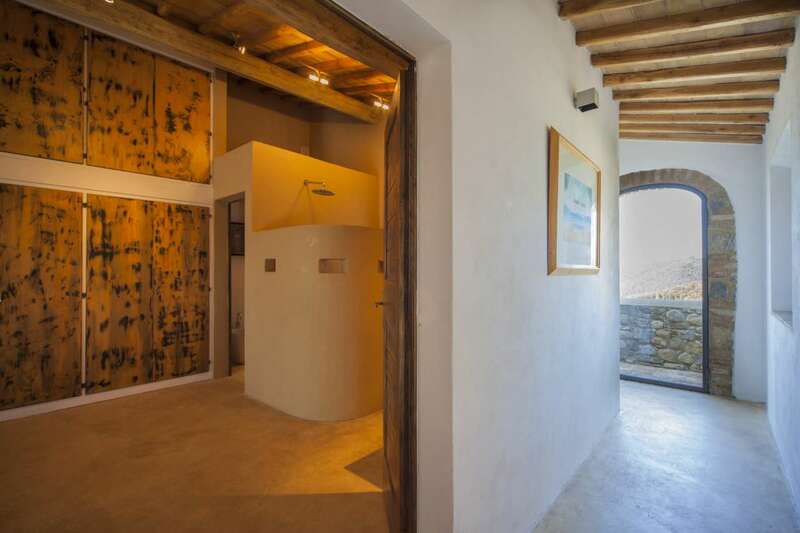 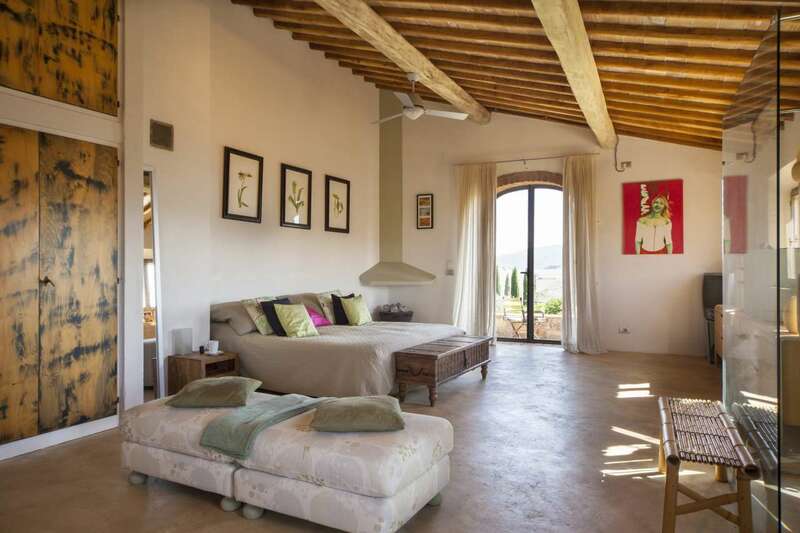 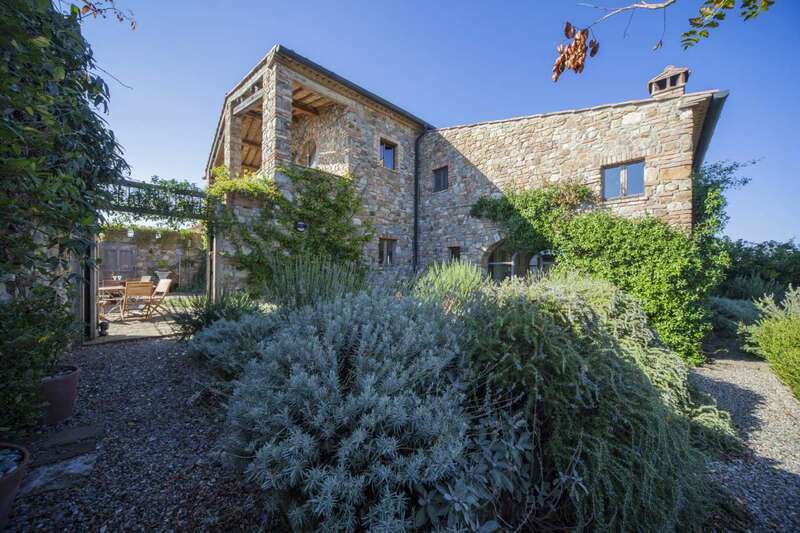 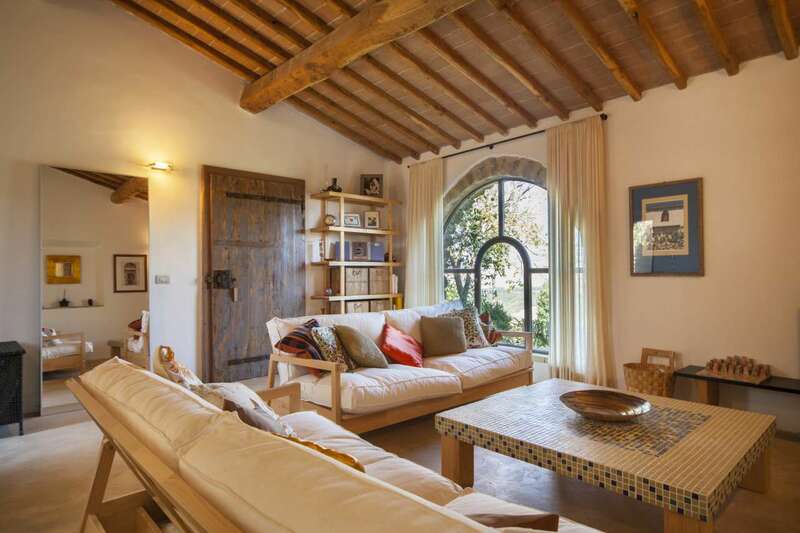 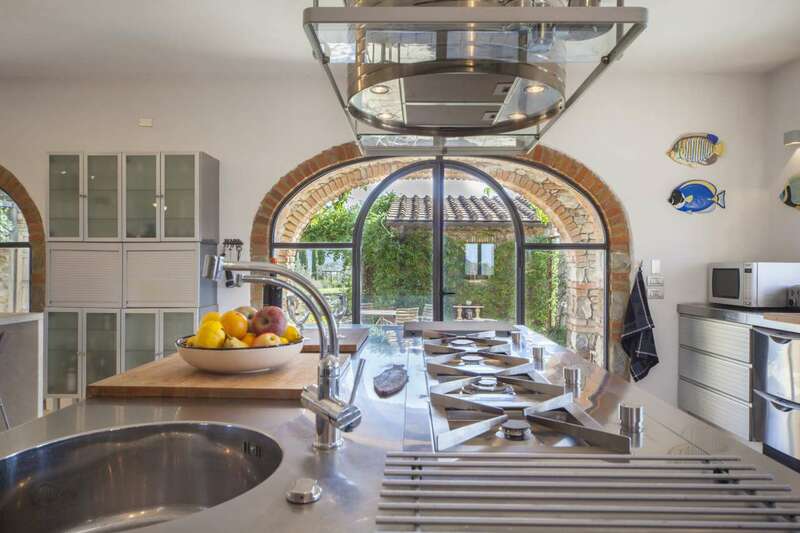 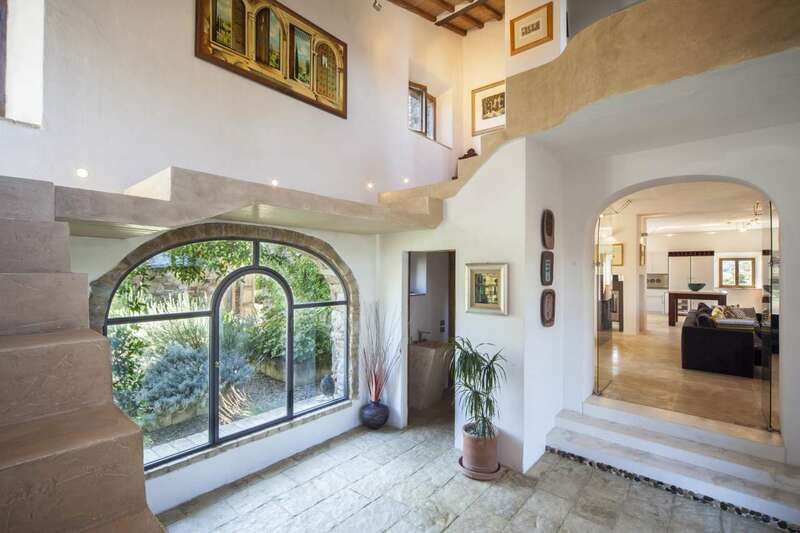 The property is composed of two buildings and an outhouse each of which are connected by stone arches, creating a very charming internal courtyard perfect for entertaining and outdoor dining. 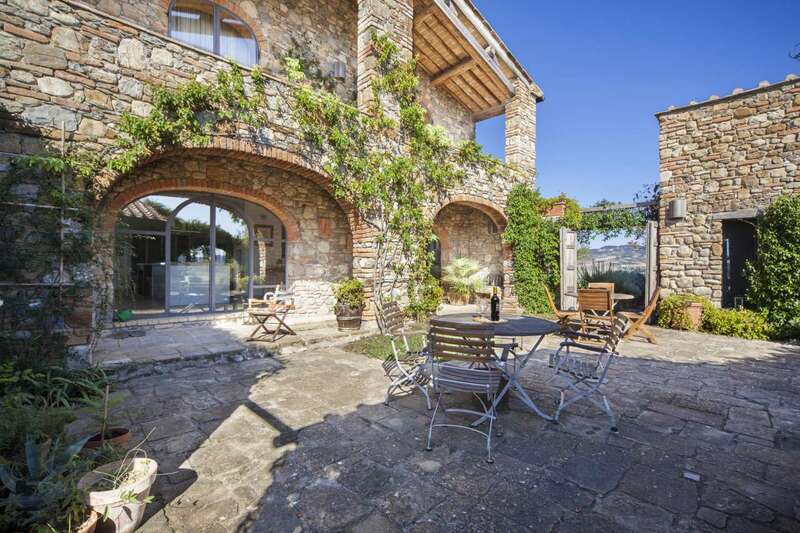 The living room area features beautiful loggia which lead outside making the courtyard feel like an extension of the house. 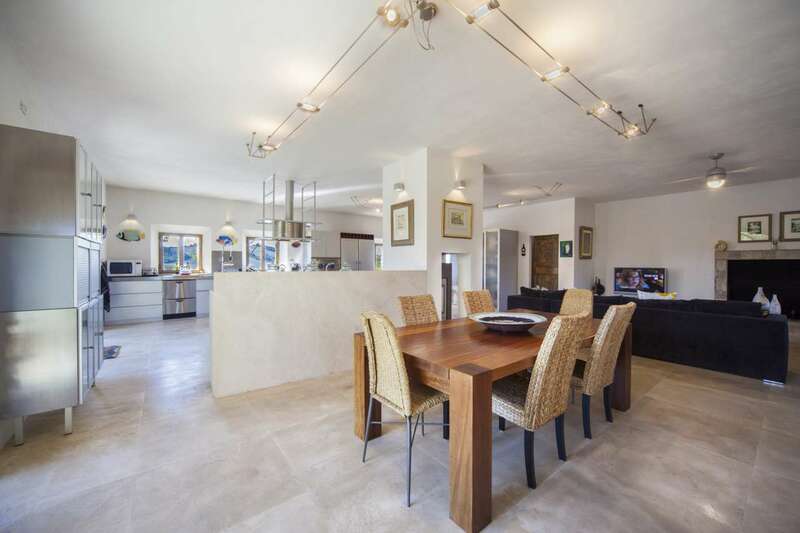 The main house offers approximately 370m2 of floor space which composes an open-plan living room / diner, an office, open plan living room area with fireplace, main entrance / hallway with guest bathroom. 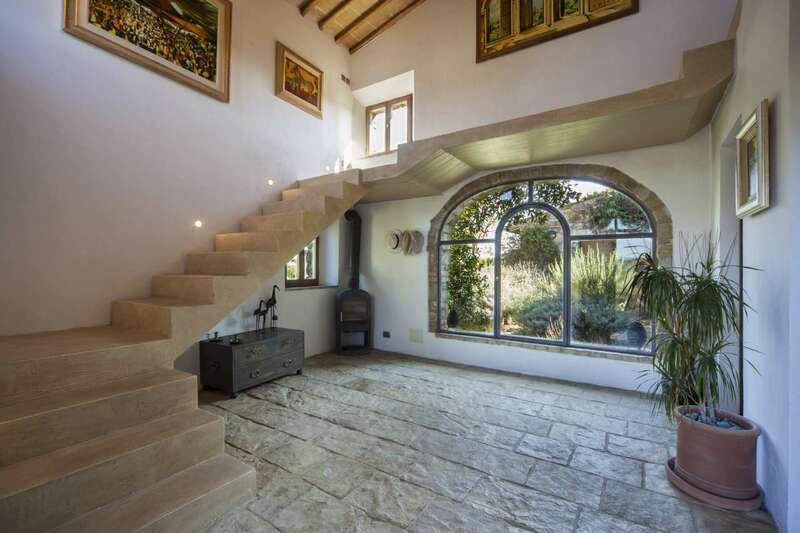 The custom built stone stairs which seem to float without assistance create a predominant focal point in the main entrance. 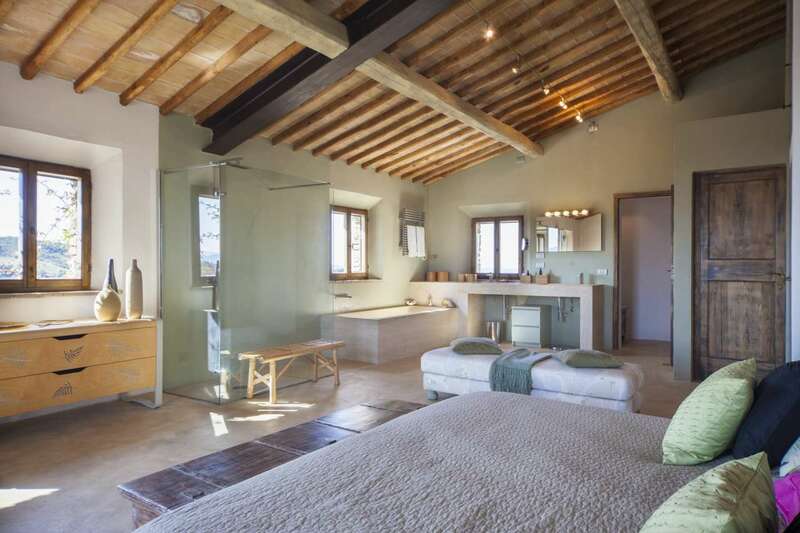 The whole of the ground floor enjoys an abundance of natural light, something which is not easy to find in farmhouse of this age. 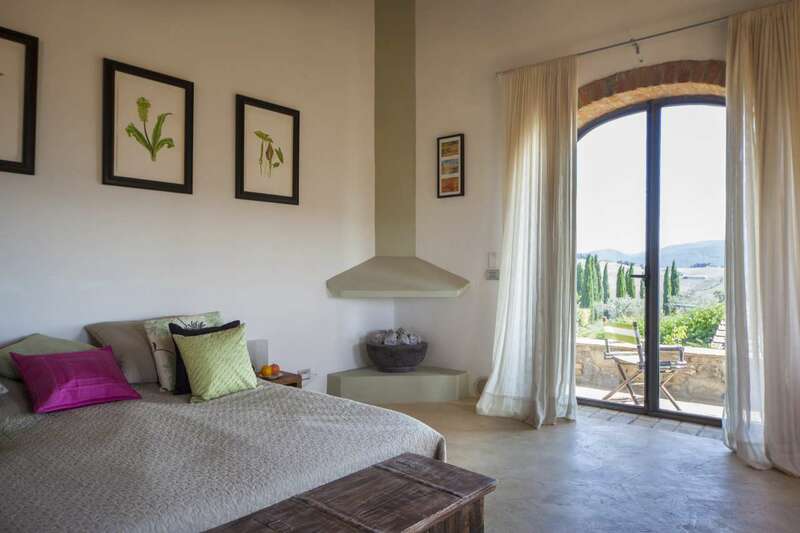 The first floor is composed of two very spacious principal suites each with en-suite bathrooms, fireplaces and access to balconies. 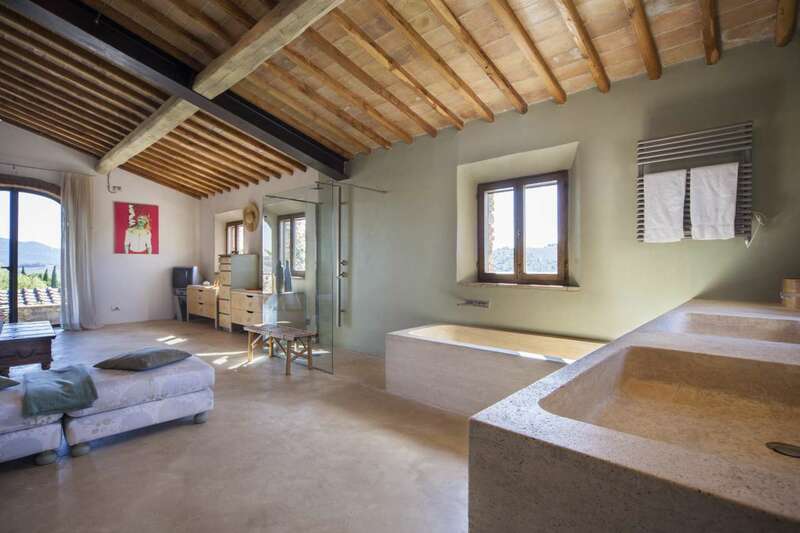 There is also a laundry room on the first floor. 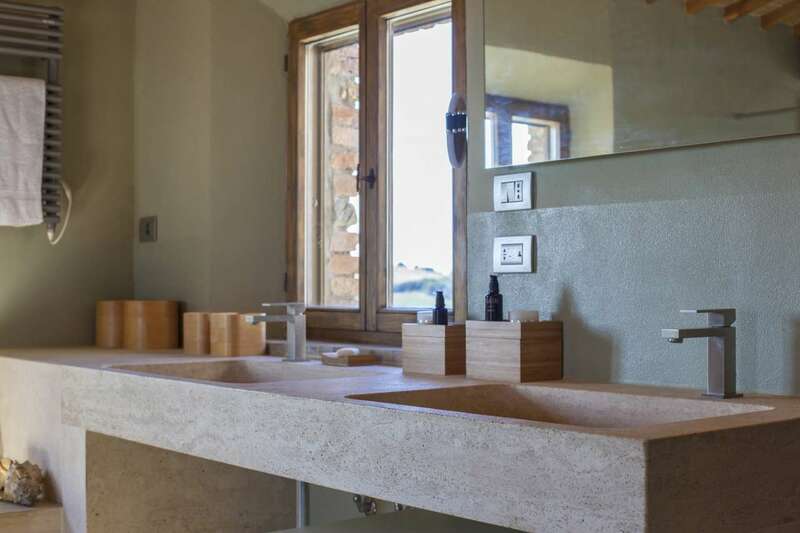 The quality of the materials and finishes is of the highest standard and maintained in immaculate condition. 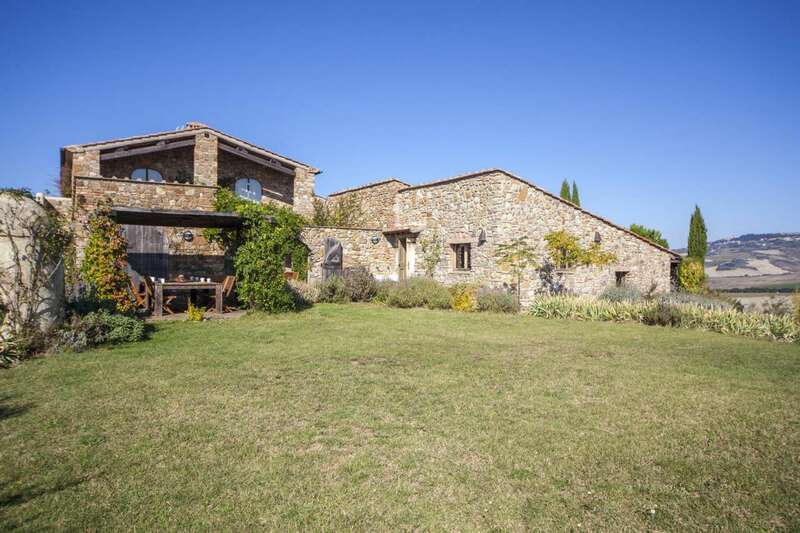 The house has under floor heating, resin floors, wood burning fireplaces, ADSL internet, gas and electricity. 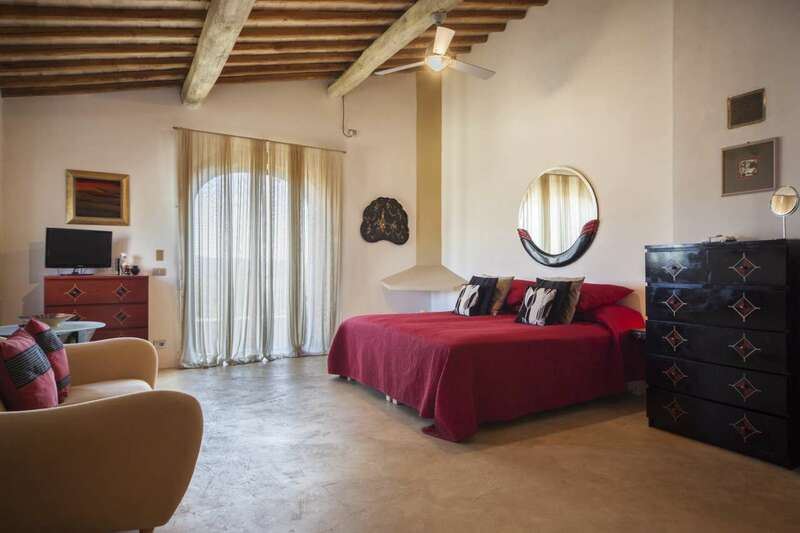 The guest house offers approximately 100m2 of floor space and its current layout comprises living room, gym, bathroom, bedroom with en-suite. 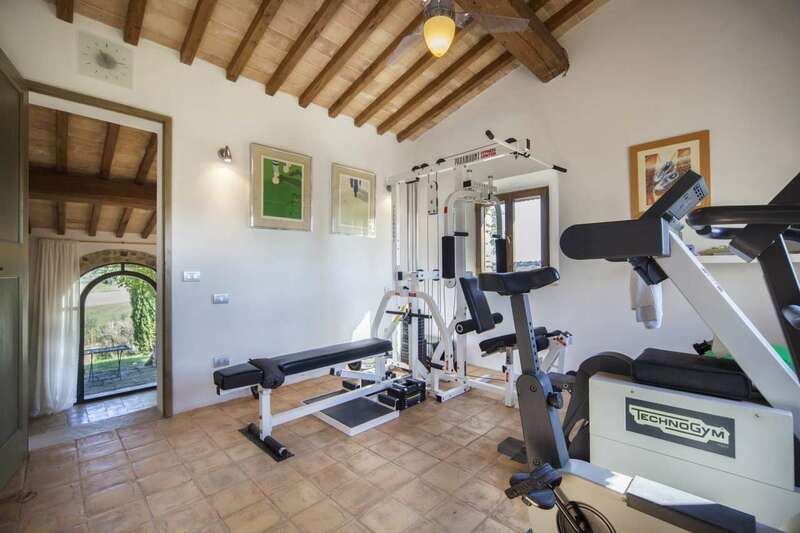 The gym was previously intended to be a second bedroom which would make this structure into a charming two bedroom, two bathroom house with living room. 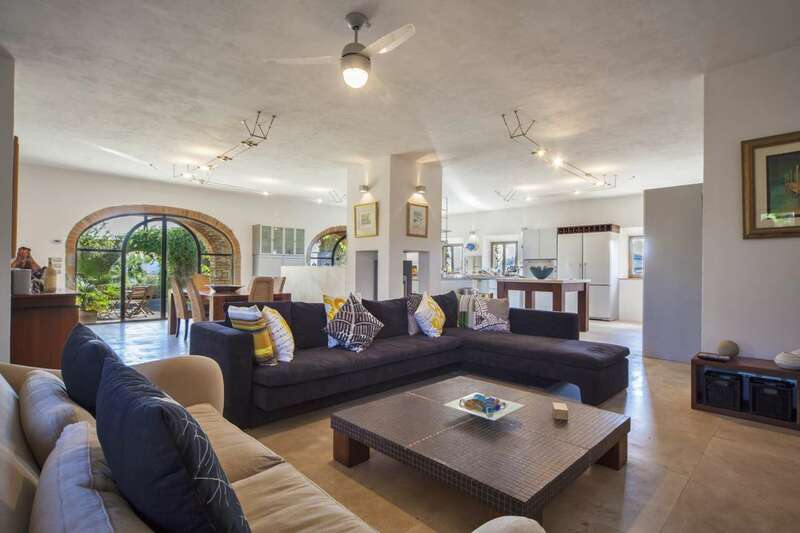 Again this property enjoys lots of lovely natural light and it has 3 access points from the outside, perfect for family living around the pool and courtyard. 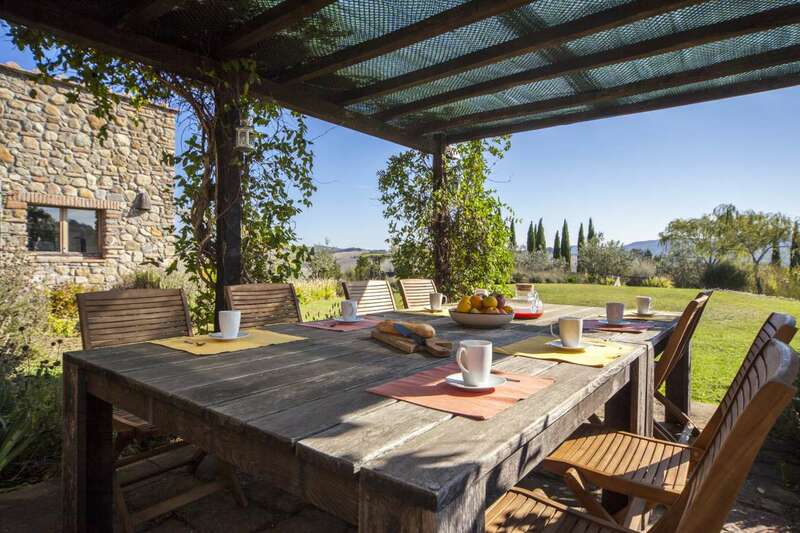 The grounds surrounding the property cover approximately' 1 hectare and include a lovely lawn, numerous terraces and patios perfect for a bit of privacy and a quiet read, manicured flower beds, a herb garden and approximately 100 olive trees. 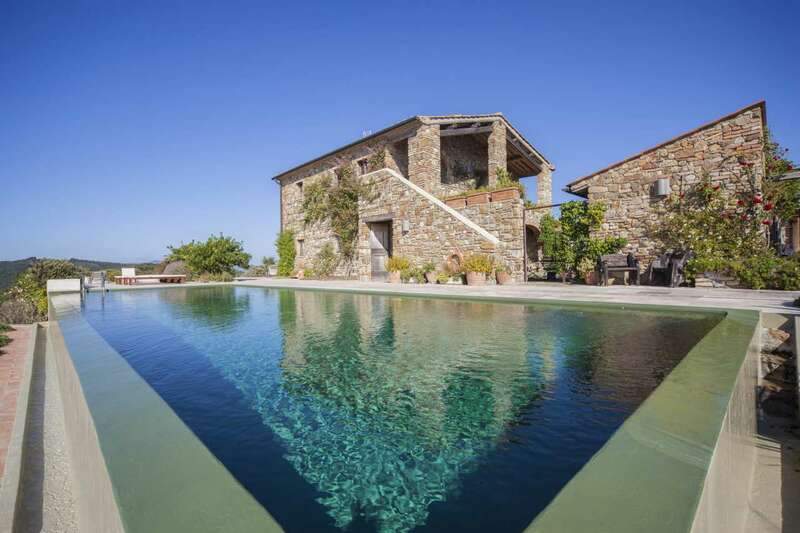 The whole of the outdoors offer breathtaking 360 degree views, however the views are particularly good from the south side where the infinity pool is positioned. 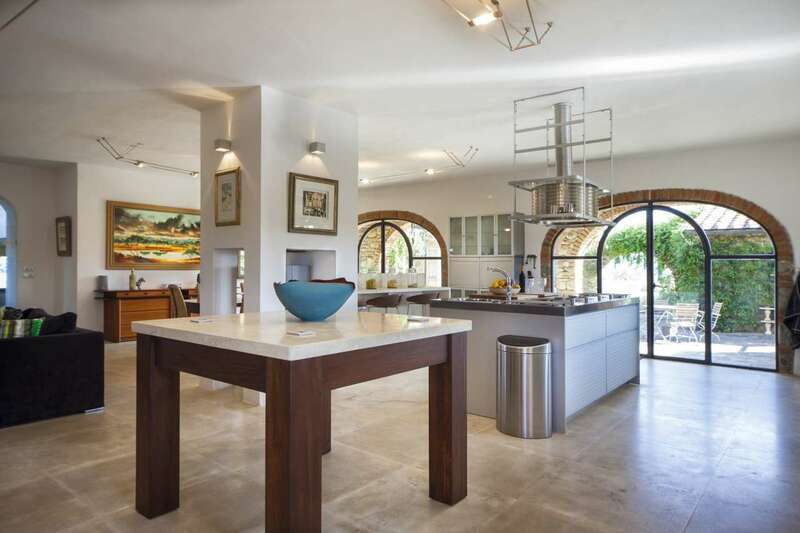 Measuring 15 x 5 and finished in resin with a travertine and marble surrounding. 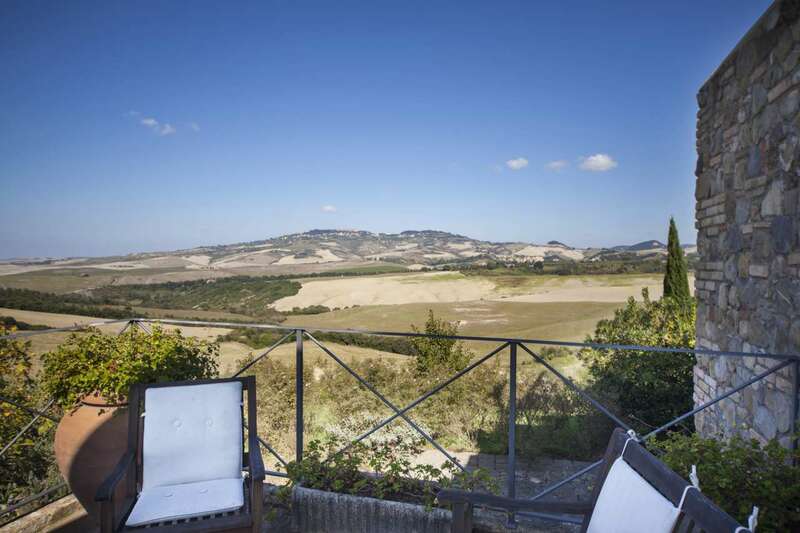 Only 15 minutes from the medieval town of Volterra and only 20 mins from the medieval UNESCO world heritage town of San Gimignano. 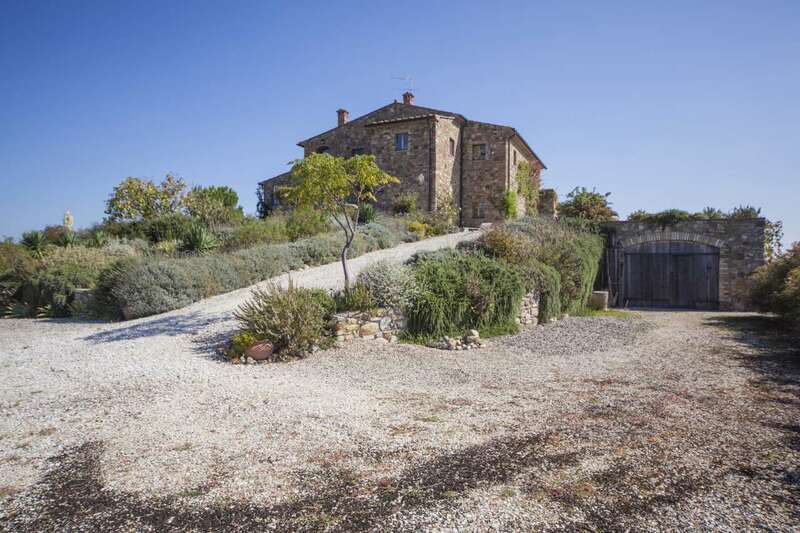 The property is accessed via a white road which is flat and kept in good condition. 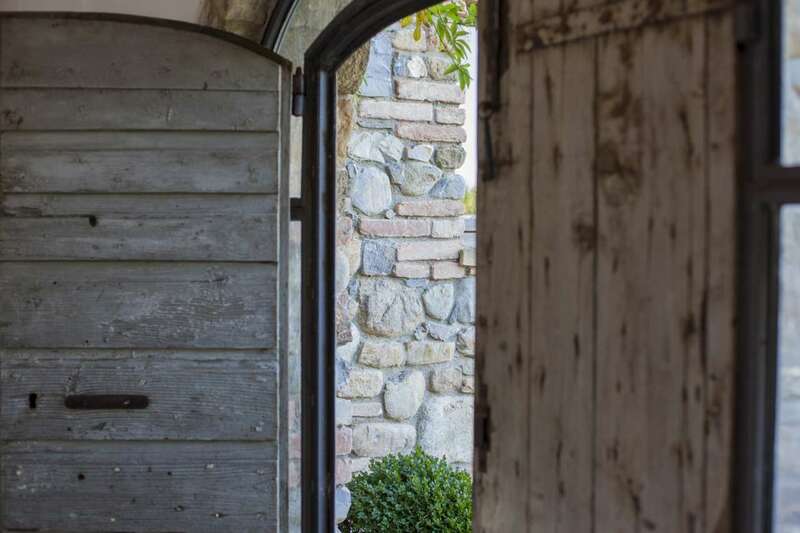 Upon arriving at the gates of the property there is a 2 car garage.